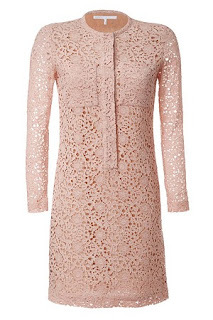 A Touch of Tartan: Kim Sears Green Lace Dress in Pink! Kim Sears Green Lace Dress in Pink! As posted earlier, Kim Sears wore a green lace dress earlier at the Wimbledon Final to support boyfriend, Andy Murray. I understand that the dress is now sold out but it is still available in pink for anyone looking for an alternative (or at least it was available at the time of this posting).